If you follow our website, you know that we are huge fans of Subarus and Toyotas. We sell far more Toyotas than Subarus only because it is so difficult to find Subarus available in the private sellers' marketplace. 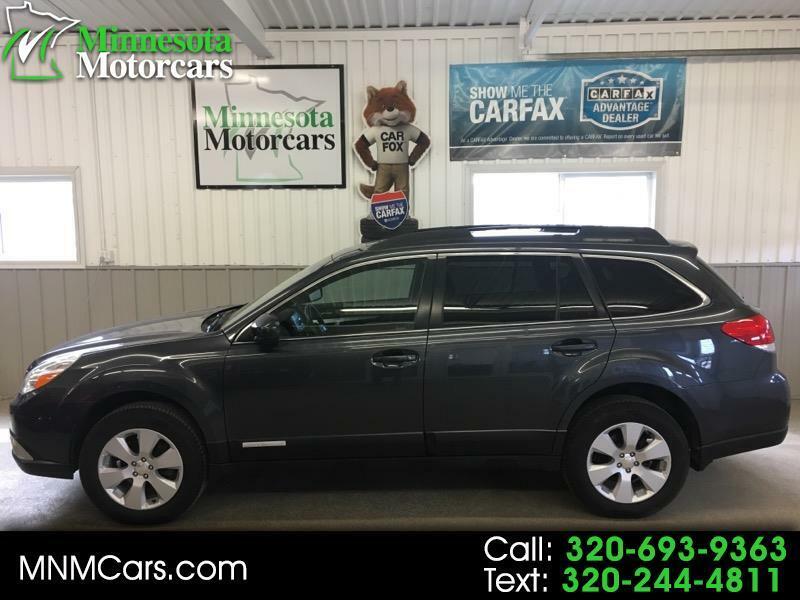 When we are lucky enough to find a beauty, such as this magnificent 2011 Outback 2.5i Premium, we jump through hoops to purchase it. This one came from a quality local private owner and shows that it was meticulously cared for. This one shows as close to new as is possible for a 2011 vehicle. The list of standard items on the 2.5i Premium is lengthy. It includes 17" alloy wheels (with near new all-season 225/60R17 radial tires), roof rails w/integrated and retractable crossbars, auto-on 4 beam headlights, fog lights, power mirrors, variable intermittent windshield wipers, rear window wiper, AM-FM stereo w/CD player inc. MP3/WMA capability, aux input, 4 speakers, in glass antenna, 10 way power driver seat, 4 way manual passenger seat, tilt/telescopic steering column, full instrumentation, ECO full gauge, power windows, and power locks. This one even has the All Weather & PWR Moonroof PKG which includes front wiper de-icer, heated front seats, heated exterior mirrors, power tilt/slide moonroof w/manual sunshade, rear vision camera system, auto-dimming rearview mirror w/3.3" rear camera display, compass, and HomeLink garage door system. Added to those extras are the integral splash guards, the rear bumper cover, and front, rear, and cargo all weather mats. One more thing, this one has the long range Astrostart Remote Starting System! Come see this magnificent Graphite Gray Metallic, with Off Black interior, beauty before some other lucky buyer runs off with her. Thanks for viewing this very special automobile!